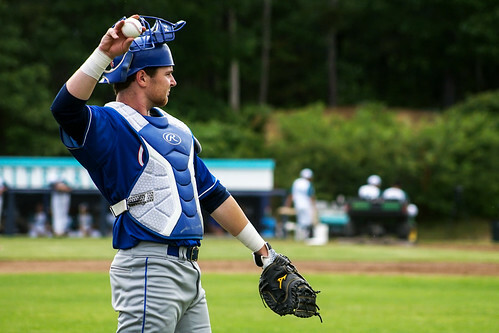 With two consecutive victories under their belt, the Chatham Anglers look to notch their third-straight win when they take on the Cotuit Kettleers at Lowell Park on Sunday. Chatham’s two-straight wins — both coming at Veterans Field — came after Thursday’s off day. In both contests, the pitching staff has been on its game. Against Yarmouth-Dennis on Friday, Jack Conlon (San Jacinto), Colin Peluse (Wake Forest) and Greg Veliz (Miami) allowed five hits and two runs while striking out the 11. Saturday’s quartet of Dan Hammer (Pitt), Nick Schneider (UCLA), Zach King (Vanderbilt) and Andrew Miller (Kentucky) held Harwich to four hits and one run Saturday. Looking to keep the momentum going against Cotuit will be Alek Manoah (West Virginia). Manoah pitched in the second game of Chatham’s doubleheader against Cotuit, but the game was postponed due to fog before five official innings could be played. In his two other starts, Monoah has notched 11 strikeouts in nine innings of work while giving up one earned run. Cotuit is coming off a loss at Y-D on Saturday. Despite a 3-for-4 outing from Cory Wood (Coastal Carolina), the Kettleers could only muster one run, while the Red Sox had four runners cross the plate behind three-hit days from Reese Albert (Florida State) and Andrew Daschbach (Stanford). The Anglers — currently in third place in the Eastern Division — are only two points behind first-place Y-D and one-point behind second-place Harwich. However, Y-D has played one more game than Chatham and Harwich has played two more contests. Chatham does have the best run differential of the three teams at +10. One player who will be out of the lineup again Sunday is Kyle McCann (Georgia Tech). The rising sophomore is competing in the College Home Run Derby at TD Ameritrade Park in Omaha, Nebraska on Sunday. McCann is one of four participants currently signed with a Cape League team. The other three are Cotuit’s Thomas Dillard (Mississippi), Falmouth’s Logan Davidson (Clemson) and Wareham’s Parker Phillips (Austin Peay). "I told him he was going to hit zero,” Tristin English (Georgia Tech) said. “Realistically…I think he hits eight in the first round and then from there it's on him."